Oriental Fruit Moth (OFM): The third brood should be treated based on the timings below. Overall pest pressure is light with some exceptions in northern counties. Bacterial Spot: Bacterial spot has been building on leaves is susceptible varieties. While we are past pit hardening and the most damaging injury, fruit infections can still occur. Maintain coverage with low rates of copper products and use oxytetracycline during infection periods. Codling Moth (CM):The 2nd generation flight is underway in all counties. The second applications are due now. Some farms are experiencing higher pest pressure from this insect as indicated from adult trap captures. If you have been on an exclusive pyrethroid program, then switch off to something else at this time. Other products could include, Delegate, Altacor, Belt, Tourismo or Voliam products. Spray timings are outlined in the table below, but be aware that this generation has had a habit of ‘stretching out’ during the last few years. Therefore, trap counts in excess of 5 males per trap will trigger additional sprays for this insect. Woolly Apple Aphid: Woolly aphids continue to appear in some blocks in southern and northern counties. Two additional farms were recently seen with small WAA populations. See the last two newsletters and the TFPG for control options. Spotted Wing Drosophila (SWD): The average number of male SWD in Atlantic and Burlington counties has increased over the past week. The average trap count in Atlantic county was 1.93 and 0.6 in Burlington county. In addition, the total number of sites where SWD adults are being found increased in both counties to 19 sites in Atlantic county 4 in Burlington County. 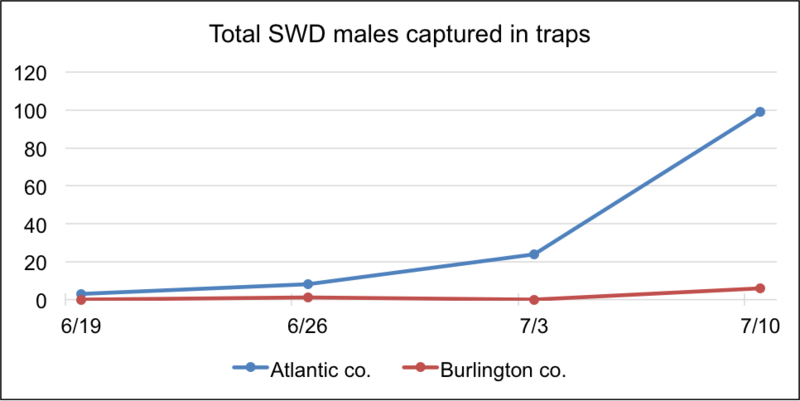 Trap monitoring for SWD adult males will continue throughout the remainder of the season. We also started salt testing the berries for presence of larvae and had 3 positive tests in Atlantic county, and no positive tests in Burlington county. All positive samples were from already harvested Duke and other untreated fields. All growers should continue to follow the 7-day insecticide program for SWD. Malathion still has a 24C label for the high rate as used last year with a 1-day PHI. This means you can use the Malathion 8F at up to 2.5 pt/A or 2.5 lb ai/A. The high rate is what is needed for good SWD control. Blueberry Maggot (BBM): We had the first catch of BBM in Burlington County this past week. Overall, numbers for BBM remain low in both counties. Sprays for BBM must be applied on a regular schedule for growers exporting to Canada. However, nobody is really exporting to Canada at this time. Treatment options effective against BBM and SWD include: Asana, Adjourn, Brigade, Danitol, Exirel, Hero, Imidan, Lannate, and Malathion. Sharp-nosed Leafhopper (SNLH): Trap counts remained about the same compared to the previous week in both Atlantic and Burlington Counties (see table below).This is not a critical pest at this time. Oriental Beetle (OB): Trap numbers remained the same in Atlantic County over the past week and decreased in Burlington County (see table below). Based off of the numbers, peak emergence has already occurred. Since the target for treatment applications is OB larvae, treatments should have already been made at this time. Anthracnose: Starting this week we are evaluating percent anthracnose on second pick Bluecrop. Fruit is incubated at room temperature for one week and then evaluated for percent anthracnose. This will be compared to fungicide spray records to help evaluate program effectiveness. In addition, over the past week 22% of the sites that were scouted had some anthracnose visible in the field in Atlantic County.